I thought your service (and price) from beginning to end was excellent and was most impressed by the speed with which the cable arrived. 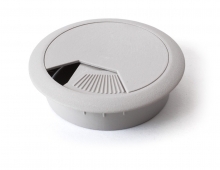 Desk Grommet - 50mm Grey + FREE SHIPPING! If your home or office desk came with cable management holes (or has brand new holes after a woodworking accident) the best way to tidy up that mess and stop pens from falling into the void is with a simple push-in desk grommet. With a spring-loaded trapdoor that easily swivels away, you can route your cables through to beneath your desk easily and quickly. No tools are needed for the grommet installation (unless you need to drill the hole first) so it's just a case of matching sizes. This grommet fits in desk holes 50mm in diameter, with a 60mm diameter flange and 16mm deep bushing. *Note: No cables are included with this grommet. Answer: "Unfortunately we only have Black and Grey available from our suppliers at present."